If you have last-minute hosting duties or have just forgotten to clean the house in a while, use the 15-minute cleanup plan for any room (or all of your rooms). Try setting a timer and doing it all in 15 minutes. Things that don't belong in the room. Things that belong in the room, in a different place. Having only a few categories to sort items into makes a pickup run more smoothly. The 15-minute cleanups also work because they are designed to maintain a room. Having a quick cleaning session in a room several times a week will keep your home looking great between more intense cleanings. A 15-minute cleanup is a brief step-by-step guide to cleaning a room in 15 minutes or less. While the room may not be white glove clean, it will be presentable to guests. Quick cleanups are a great way to maintain a home in between more thorough cleanings. These cleanups include step-by-step instructions, a list of supplies, tips, and links for more thorough information. A 15-minute cleanup is not the only cleaning regimen you’ll need to keep your home in tip-top shape. It’s not an intense cleaning, but only a brief pickup of a room. 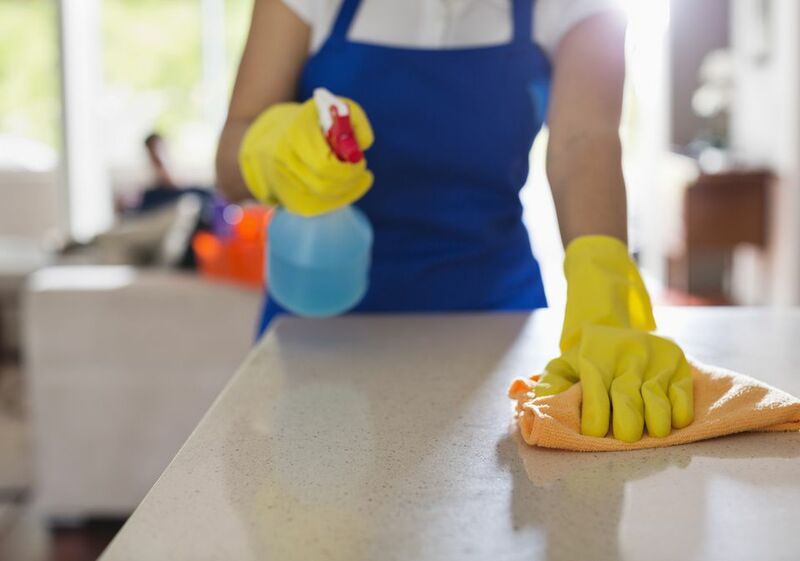 To really keep a home clean, more thorough work will need to be done according to your cleaning schedule. Before intensely cleaning a room, it’s a good idea to start with that room's quick 15-minute cleanup. 15-Minute Living Area Cleanup: This cleanup can work for formal and informal living areas and sitting areas. It also works for formal dining rooms and other rooms where entertaining is done. The idea with this cleanup is to get the room ready for guests or events without spending a lot of time on the details. 15 Minute Kitchen Cleanup: The kitchen cleanup aims to remove trash, dirty dishes, and unwanted items from a kitchen, making it ready to be used or in good shape for guests to be around. While you won’t scrub out the refrigerator or clean under the sink in this cleanup, you will remove any offending trash and dishes, making your kitchen clean and clutter free. 15 Minute Bathroom Cleanup: The bathroom cleanup helps you quickly organize and wipe down bathroom surfaces. This cleanup will work to maintain your weekly bathroom scrub down or get a bathroom ready in a hurry when unexpected guests show up. 15 Minute Kid’s Room Cleanup: This kid’s room cleanup is great for parents at a loss for where to begin when faced with a disaster area child’s room. It’s also perfect for older kids who can actually follow the list themselves to get their rooms clean. Print it off for them and watch as an all-day chore turns into a 15-minute miracle. For a fun twist, set an actual timer or countdown clock and turn the cleanup into a beat-the-clock challenge. 15 Minute Bedroom Cleanup: After a busy day or week, a bedroom can be in terrible shape. This cleanup will help maintain a bedroom or give it a quick pickup just in time for a restful night. 15 Minute Dorm Room Cleanup: The dorm room cleanup is for those who live in a very small area like an efficiency apartment or campus housing. These small places can quickly fill up with junk and trash, but this quick cleanup will help organize even the worst-case scenario. If you need a little more intense cleanup, try a deeper clean. These cleanups will take you between one to 2two hours per room depending on how much cleaning they’ve had lately. When you make your cleaning schedule, you can use the 15-minute cleanups and the intense cleanups together to create a perfectly clean home.